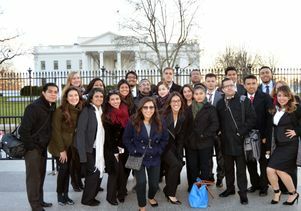 On Friday, UCLA student Christelle Rocha presented results from a survey her class gave individuals enrolled in the Deferred Action for Childhood Arrivals program to key staffers from the Obama administration and Congress at the White House. The survey showed that, on average, wages of respondents went up 150 percent. 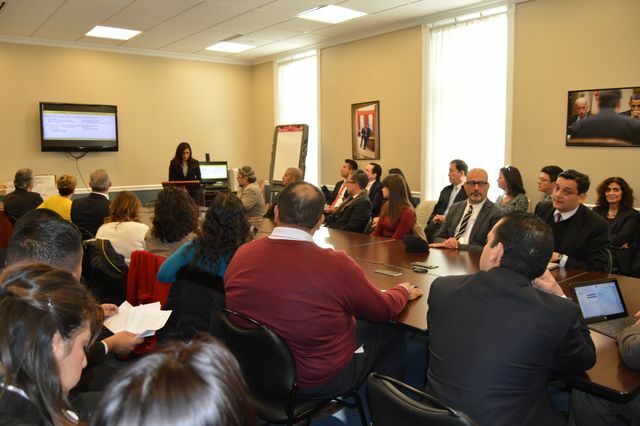 White House immigration staff members attended a briefing Friday on the economic impact of the Deferred Action for Childhood Arrivals (DACA) program, which President Obama enacted by executive order in 2012 and expanded this year. It was a typical meeting at 1600 Pennsylvania Avenue — data were presented, trends highlighted, conclusions drawn — except for one detail: The presenters weren’t administration officials or congressional staffers, but 23 UCLA students taking professor Raúl Hinojosa-Ojeda’s Chicana/o studies M122 class. The hands-on research course, “Planning Issues in Latina/Latino Communities,” engaged students this fall quarter in an economic impact analysis of the DACA program in Los Angeles, which Hinojosa-Ojeda considers the “capital of the immigration crisis.” The DACA program gives certain qualified undocumented individuals a temporary exemption from deportation and allows them to acquire two-year, renewable work permits. It does not give them legal status or provide a path to citizenship. Working without research funding, the UCLA students reached out through their community organizing contacts, university-affiliated groups and social media to promote their economic impact survey. So far, they have achieved a 20 percent response rate, receiving 200 completed surveys after sending out about 1,000 inquiries. What they’re finding is staggering: On average, individuals enrolled in DACA have experienced a 150 percent increase in wages. This means that estimates based on previous studies (including one by Hinojosa-Ojeda himself) that comprehensive immigration reform could generate $1.5 trillion in GDP growth over the next 10 years are extremely conservative in comparison. UCLA student Francisco López-Flores (center), who came up with the idea for the survey, found that his wage at a restaurant increased after he enrolled in DACA. 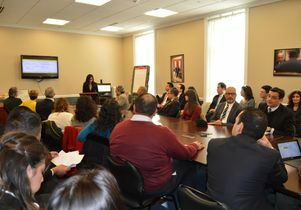 The study's findings were considered so important by Felicia Escobar, special assistant to the president on immigration and a UCLA School of Law graduate, that she invited the students to come to Washington, D.C., to present their data to White House and Congressional staff. Though dramatic, these findings are not at all surprising to members of the UCLA class who have been personally impacted by the program. After he enrolled in DACA, López-Flores’ restaurant wage increased to $10 an hour. He now works as an analyst in the UCLA Health System, earning a wage that he says is supporting his education and his family. Based on his personal experience, López-Flores designed a survey for another course. Intrigued by what the student was finding with a small sample size, Hinojosa-Ojeda asked López-Flores to join his M122 class and lead the effort to administer the survey more broadly. M122 students believe that the economic perspective is key to getting buy-in from reform opponents. Undocumented immigrants in L.A. generate an estimated $150 billion in economic activity annually, according to Hinojosa-Ojeda. “If we can create these economic frames, we can make it a pocketbook issue for people who are against immigration,” said López-Flores. Students also presented on the potential impact of formalizing undocumented immigrants’ economic participation. If remittances to places like Mexico and El Salvador could be formalized, or converted from cash to high-tech platforms like debit cards and then connected to micro-finance organizations, money could be invested and used more productively in the U.S. and those countries. Such a move could stem the tide of people seeking financial improvement in the U.S., Hinojosa-Ojeda said. Students watched from their classroom in November as President Obama announced his most recent executive order, the creation of the Deferred Action for Parental Accountability (DAPA) program. DAPA provides the parents of undocumented immigrants the ability to request deferred action from deportation and obtain employment authorization. At Friday's meeting, M122 students asked key Congressional and White House immigration staff to imagine the economic impact, both locally and globally, of giving 7 million more people the means to become formal, powerful economic actors. 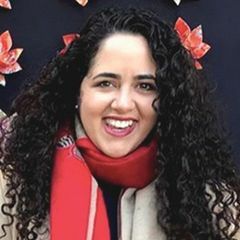 López-Flores said members of President Obama's staff were so impressed by this economic argument that they have asked the group to send their research report to help inform new policy solutions. 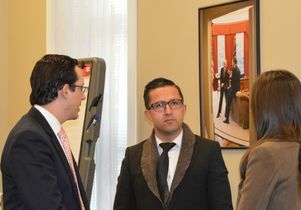 López-Flores talks with attendees at the White House presentation.